Individuals who acquire diabetes typically manage the disease by following lifelong care plans. Nurses help people with diabetes by providing treatment and educating patients about disease management. Nurses can hold specializations in care for type 2 diabetes, type 1 diabetes, prediabetes, and gestational diabetes. New methods for managing diabetes are discovered frequently. Nurses who stay up-to-date on any new information surrounding diabetes are able to provide better management tools to people with diabetes. There are five key ways that nurses help individuals manage their diabetes. Learn about diabetes and how it affects the body, treatments, and self-care. Nurses can explain to people diagnosed with diabetes how to best manage their disease on a specific case-by-case basis. They can teach patients how to self-administer insulin injections, or a private duty nurse can administer shots for the patient. Nurses can also provide education on how to check blood sugar levels and track diabetes through the use of a blood glucose monitor, and what to do when an insulin reaction occurs. 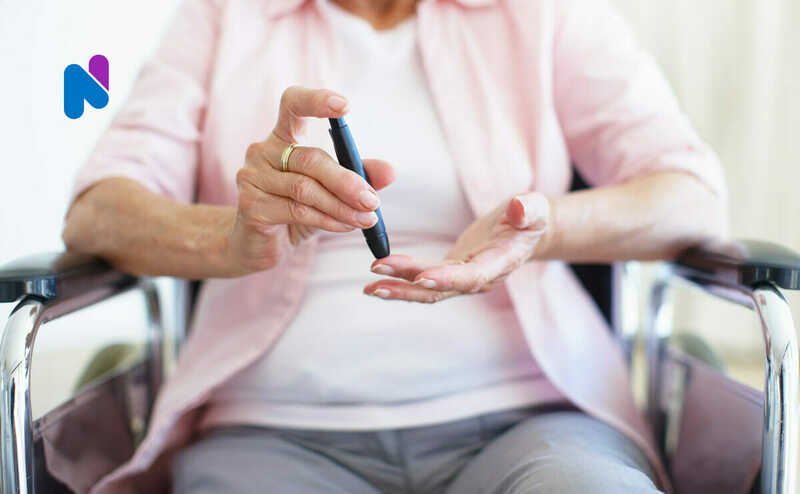 They can also educate individuals on recognizing symptoms of high and low blood glucose, and ultimately what they should do if symptoms arise. Nurses can also guide people on how to make healthy lifestyle choices such as which foods to eat, how to quit smoking, and which exercise would be best for them. Discover the underlying cause of diabetes and the disease process. Diabetes occurs when the pancreas stops producing insulin or when the body becomes insulin resistant. The exact reason is unknown, yet there are environmental factors that can contribute to the cause of the disease. Risk factors include a lack of exercise, obesity, and genetics. If there is a family history of any parents or siblings with the disease, the risk for diabetes will increase. Prevent diabetic complications. Complications can be short-term and/or long-term. Acute complications consist of diabetic ketoacidosis (DKA) and hyperglycemic hyperosmolar non-ketotic syndrome (HHNS). There are some basic prevention methods. Diabetics should take medications as prescribed by a doctor and monitor blood sugar levels. They should enjoy a balanced diet and avoid skipping meals. Exercise is very important in diabetes management, too. Long-term complications regarding the cardiovascular system, eyes, nerves, or kidneys may begin to appear after a couple of years. Some methods used to prevent these chronic complications include aggressive control of blood sugar, treatment of other issues like high cholesterol, and use of aspirin. Get early screening done for eye problems like glaucoma and retinopathy. It is also important to take control of blood pressure levels and have yearly blood tests. Correct and reverse abnormal metabolic functions. There are multiple ways to correct and reverse abnormalities in the metabolic functions. These methods include diet modification, proper hydration, and use of dietary supplements. Use of these methods will improve metabolic efficiency and even strengthen cellular biochemistry. Repair the balance of electrolytes, acid-base balance, and fluids in the body. Electrolytes are minerals-such as calcium-that help move nutrients into cells and remove any unwanted waste. Electrolytes can be administered through the use of IV fluids, IV medications, oral medications, supplements, and hemodialysis. The ideal pH level is around 7.3. This level can be acquired through eating and drinking less acidic drinks or foods. The key is to eat enough fruits and vegetables and drink plenty of water to return to an alkaline state. A nurse can help diabetes patients on many levels. At NurseRegistry, we have private duty nurses specialized in diabetes management. Our nurses can provide home visits to administer insulin injections, perform wellness checks, manage medications, and more. Call us at 650-462-1001 to discuss your needs and speak to one of our Care Coordinators. Information for professionals can be found at the Centers for Disease Control and Prevention. The American Diabetes Association has resources for diabetes professionals in their research and practice page. Plenty of resources and information are located at the International Diabetes Federation.